Although it bears no royal insignia or any finery, this is the head of a sovereign: Jayavarman VII (r. 1181-1218?). The king is portrayed at a mature age, his features somewhat fleshy, his eyes lowered, meditating in utmost humility. His lips are set in the famous “Angkor smile”. The sculpture belongs to the Bayon style (late 12th early 13th century) in which sculptors relinquished the rather impersonal ideal canon of youth and beauty of earlier periods, adopting a more naturalistic, terrestrial, human style with sensitive modelling, and occasionally drawing inspiration from the physiognomy of the king or his contemporaries. Although full of restraint, these works profoundly express royal grandeur through the sense of devotion and spiritual serenity. Several known statues have been identified as portraits in which the sovereign is portrayed at different ages, seated, paying homage to Buddha. The reign of Jayavarman VII came after a turbulent period that had culminated in 1177 with the sack of Angkor by the Chams. During this Khmer renaissance, and no doubt due to a loss of confidence in the protective power of Shivaism, Jayavarman VII adopted mahayana Buddhism as the state religion. This change implied new iconographic and esthetic directions and was given supreme expression in gigantic architectural programmes. 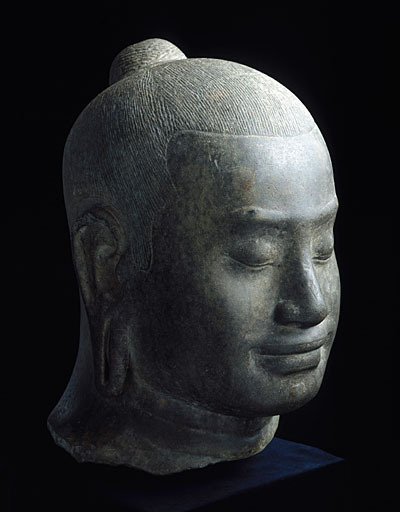 Art thus became the vehicle of a specifically Cambodian Buddhism in which the king represented the epitome of devotion. This short-lived, brilliant period came to an end with the resurgence of Shivaism in the mid-13th century.